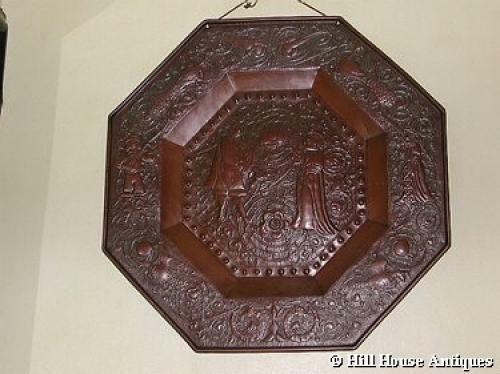 A superbly worked and large, imposing, rare octagonal Arts & Crafts copper love plaque/charger by the Keswick School of Industrial Arts, Executed by John Rigg, one of their craftsmen there between 1898 and 1921. This is an early piece by him and is lightly incised to the back with his signature and also dated 1898. The plaque is also stamped with the KSIA mark to front. A most unusual and beautifully worked and richly adorned piece, with a dashing gentleman and lady in the centre panel amongst a set of stylised foliage and scrollwork. Also decorated with peacocks and serpents to borders as well as a minstrel and lady-in-waiting to either side of the central panel; all symbolic of love.